Preheat oven to 350° F. In a small skillet, sauté the onion, garlic, and olive oil over medium heat until soft. Meanwhile, in a medium skillet, fry the bacon until crisp, then drain the fat. Crumble bacon and add to onion mixture. Remove from heat and set aside. Bring a large pot of water to a boil, add macaroni and cook to a little less than al dente. Drain and set aside. To make the cheese sauce, melt butter in a saucepan over medium heat. Slowly mix in flour and cook 6 to 8 minutes, stirring constantly. Slowly whisk in milk and cook over medium to medium-high heat until mixture thickens. Add 1 cup Jack cheese, 1/2 cup mozzarella cheese, 1/3 cup cheddar cheese and cream cheese. After cheese is melted and thoroughly combined, add in bacon and onion mixture and cooked pasta. Pour mixture into a 9×13-inch baking dish. Top mixture with remaining 2/3 cup Cheddar cheese. Bake 15 to 20 minutes. Remove from oven and let macaroni and cheese set up at least 30 minutes before transferring to pizza crust. When macaroni and cheese is ready, brush prepared pizza crusts with a small amount of olive oil. 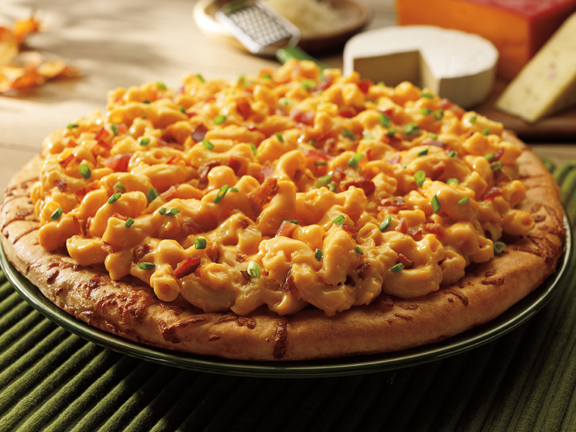 Spoon the macaroni and cheese across the crust, topping with extra cheddar cheese. Bake at 350°F for 15-20 minutes or until crust is completely done and cheese is melted.